Targeting this pet and emoting /whistle will cause Crackers to sit on your character's shoulder. This pet is only available to Rogues, however any class can summon it once it has been added to your collection. To collect this pet, players must complete the following. 4. Complete the Broken Shore campaign up to the breadcrumb quest at Deliverance Point, Champions of Legionfall. This leads back to the Rogue Order Hall where the quest The Pirate's Bay becomes available. 5. Continue this quest chain, and the class pet will be the reward from Fit For A Pirate. The P/P version of Axebeak Hatchling pet is identical to Crackers (from a battle perspective, not including the way it looks). 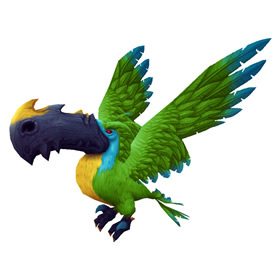 This parrot is something of a traitor - he abandons his former owner, Tethys, when he discovers that you're the better pirate. After this occurs, poor, jilted Tethys appears with a tiny hozen, named Nanners, sitting on his shoulder instead. He amazingly sits perfect on a night elf's shoulder and I even love staring at him as I zip about on my flying mounts. So many people ask me where did I get him, as rogue has fallen out of popularity on my battlegroup right now. I love him, but he clips horrible through the face of every single one of my characters. I don't know if it's only for female toons though. It's annoying because having your pet sit on your shoulder is AMAZING, but I feel like I can never really use it because I have his wing coming out of my character's right eye. This was an unexpected prize from my rogue's new follower quest. I was vastly amused by the parrot abandoning ship to join my crew. Step five in the rogue quest line for obtaining your champion from 'champion of legionfall' questline awards the pet. Chain starts from The Pirate's Bay in The Hall of Shadows. Quest can be picked up from Lord Joarch Ravenholdt. You will need to meet all the pre-requisites to do the champion of legionfall questline. They say Fleet Admiral Tethys was never without his trusty parrot by his side - or on his shoulder. Tethys could always call him with a whistle.